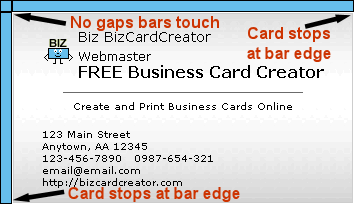 Business Card Size Guide for Free Business Cards Creator ensures your cards will print correctly when making your own free business cards online. You can use any style, background, logo, colors and fonts you can put anything on your card. By using the business card size guide below you can be sure that when you print your cards everything will print correctly and fit into the business card paper squares. The directions and pictures below explain how to verify your free business cards are the correct size. You can put anything you want to on the cards, but obviously the space is limited so using the green bars is an easy way to ensure your cards will print correctly. You don't have to use each space for what we have it labeled. 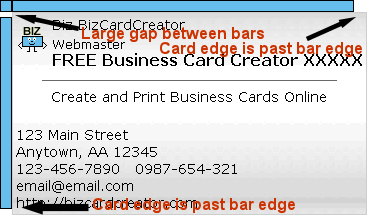 When making your free business cards as long as the card is not longer or wider than the blue bars they will print out just fine. Also, be sure that the blue bars are touching each other in the corner and not separated as shown in the picture below. If any of these problems occur we will show you several ways to correct it below. Reduce the number of words or letters on each line of your card. You can probably see which line is causing the problem, shorten the text on that line. Reduce the size of your typeface by choosing a lower numbered font on the Typeface page. Each section is labeled and is separately adjustable. Italic fonts take up more space than normal fonts try unchecking the italic box and see if that helps. Also, some fonts are more compact than others you can experiment using different fonts. Another thing to try is to change to a different style, some of the styles offer more space on the lines than the other styles. The logo also uses space on the card. If the logo is too large it can make the cards too wide or long. A good size would be 50 X 50 pixels. Use a smaller logo, a logo with a different shape, another style or no logo.